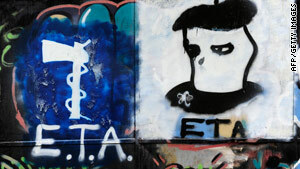 Graffiti displays the logo of Basque separatist armed group ETA in the northern Spanish Basque village of Oquendo. Madrid, Spain (CNN) -- Spain's highest court has sentenced three members of the Basque separatist group ETA to more than 1,000 years in prison for a terrorist attack against one of the nation's busiest airports in 2006, officials said Friday. Spain's Audiencia Nacional, or National Court, sentenced Igor Portu, Mattin Sarasola and Mikel San Sebastian as the ones behind the powerful bomb attack on Madrid-Barajas Airport in December 2006. The attack resulted in the deaths of two Ecuadorian nationals. They join several other ETA members who the courts have sentenced to 1,000 years in prison even though the maximum that can be served in Spanish prison is 40 years. Spain has no death penalty. Judge Alfonso Guevara, who presided over the trial, also ordered the defendants to pay €700,000 to the family of Diego Armando Estacio and €500,000 to the family of Carlos Alonso Palate, both killed during the attack. The blast came in the midst of a unilateral cease-fire ETA had declared in March 2006. The cease-fire raised hopes at the time for an end to decades of ETA violence blamed for more than 800 deaths. ETA -- or Euskadi Ta Askatasuna, which in Basque means "Homeland and Freedom" -- is one of Europe's last separatist groups. The organization, pronounced "etta," has sought independence for a Basque state in northern Spain and southwestern France since it was launched during Spain's Franco dictatorship. According to studies by the Council on Foreign Relations, ETA's structure has fissured, and many members are attempting to enter the political process.